Cities beefing up their smart infrastructure have tapped the ubiquitous streetlamp to track traffic data and measure pollution. Now, in Los Angeles, some streetlights will help keep the communications network intact after an emergency. LA is the first city in the world to install Philips-branded SmartPoles, which are outfitted with 4G LTE wireless technology by Ericsson to help boost broadband coverage throughout the city. Each pole is connected to the network by a fiber link, which helps keep a steady connection. The location of the poles—which are closer to the streets and sidewalks where people are actually using their phones than central cell towers—gives the network the advantage of being more equally dispersed across the region. That gives people more bars in some of the denser areas of the city, for example. While better day-to-day cell service is a great feature, the real benefit here in LA is that the system won’t be as likely to be knocked out by, I dunno, say, a major earthquake. After any kind of large-scale emergency in a city, our reliance on smartphones represents a major breakdown in the communications system. One part of this you’ve probably experienced yourself: The cellular network is easily overwhelmed by so many people trying to call at once. The other big problem with traditional cell towers is centralization. Once power is lost to a single tower, a large coverage area is affected (some towers have backup batteries but even these are limited). Dispersing the network to hundreds of different locations means more nodes are likely to stay up and running. “This increased reliability for the wireless network is especially important in the event of emergencies — so that smartphones stay online when they are needed most,” says Peter Marx, Chief Technology Office for the City of Los Angeles. This is the second big upgrade that LA’s street lighting received from Philips this year. 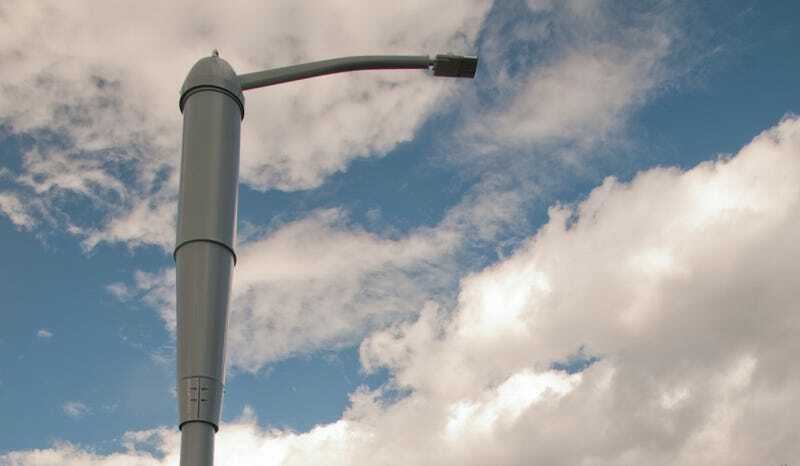 The rest of the city’s streetlamps are being upgraded to the CityTouch system, which allows their LED lights to be controlled and managed wirelessly. The cellular-equipped poles will complement this system: 100 of the SmartPoles will go up now, with 500 total installed on streets within five years. This is great news for a large city where staying connected is essential. But won’t you miss the faux-palm cell towers, just a little bit?